Over the years, we've come to realize that some customers are pickier than others. While some customers are simply hoping to see their floor, countertop, or shower look just like new again, others aren't satisfied until a very specific look has been achieved. Either way, we make a point of appeasing the individual demands of each and every customer right down to the very last detail. Recently, we were contacted by a self-proclaimed "over-cautious" customer named Sandy. When Sandy decided she needed to have a Denver grout recoloring and tile cleaning company revive the look of her shower, she decided to give us a call. After speaking with her briefly, we could already tell she would be hard to please, but we're always up for a challenge. When we arrived at her home, she welcomed us inside and explained the issue. Over time, her shower had lost its once pristine appearance and its tile and grout were now looking a little dingy. She then asked us to take a look for ourselves and, although we were unable to get any 'Before' pictures, we can assure you that her shower was most certainly in need of our help. Before beginning the project, Sandy asked us to explain the products and procedures we would be using. We told her that all of our products and procedures are odorless and are completely safe for both people and pets. While she was happy to hear this, she was even happier to find out this service came with a one year warranty. It then came time for us to get to work. First, we needed to clean the shower's dirty tile and grout. This step was important because, over time, soap residue tends to build up on shower walls, and the warm, moist environment of a shower creates the perfect breeding ground for mold and mildew. After we were done cleaning, we then needed to focus our efforts on the unattractive grout lines. We applied our proprietary ColorSeal product on them to make them uniform in color and protect them from future stains or damage. At this point, we thought our work here was done. However, after calling Sandy back in to take a look at the shower, we could tell from the look on her face that we were mistaken. She thanked us for our work and we said our goodbyes, although we knew we would be back here soon. We were right. A few days later, Sandy asked us to return and, as it turns out, we ended up returning on four separate occasions. She felt bad requesting us to come back again and again, but we assured her we didn't mind - our technicians are perfectionists and aren't happy until they know the customer is thrilled with the results. Also, we feel there's a direct correlation between how much extra effort is required to please a customer and the heightened feeling of accomplishment that follows. For this project, that feeling of accomplishment wasn't achieved until we were given her nod of approval as well as the quick note shown below. At long last, we could now take pride in a job well done! If your shower isn't looking its best, don't call just any tile and grout company to fix it up. 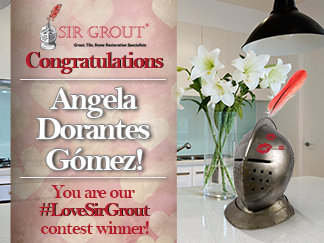 Instead, call Sir Grout of Denver: a company who is always willing to go the extra mile for any customer in order to ensure complete satisfaction. To request an appointment with us, please call (303) 542-0888 or fill out the form on our contact page. We look forward to hearing from you soon!